The guava fruit is edible, round to pear-shaped, from 3-10 cm in diameter. It has a thin delicate rind, pale green to yellow at maturity in some species, pink to red in others, a creamy white or orange-salmon flesh with many small hard seeds, and a strong, characteristic aroma that is hard to describe. 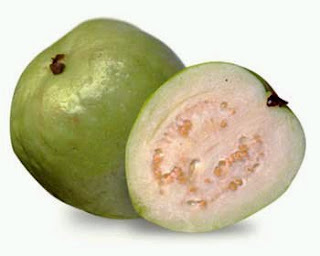 Green guava – the whole fruit is edible. The whole fruit is edible, from seeds to rind, but many people choose to cut out the middle which contains hard seeds embedded in the surrounding pulp. The pulp is sweetest and most delicious in the center, with the outer layer being sour and gritty like young pears, while the peel (fruit) is sour in taste but richest in phytochemicals; it is usually discarded but can be eaten as an enriched source of essential nutrients and polyphenols. In short, the guava is an obscure tropical food that's subtly acidic, with sweetness that intensifies as you eat your way to the center. Guava has a higher concentration of lycopene – an antioxidant that fights prostate cancer – than any other plant fruit, includint tomatoes and watermelon. In addition, 1 cup of the stuff provides 687 milligrams of potassium, which is 62 percent more than you'll find in a medium banana. And guava may be the ultimate high-fiber food: There's almost 8 grams of fiber in every cup. Guavas are often considered superfruits, being rich in vitamins A and C, omega-3 and -6 polyunsaturated fatty acids and especially high levels of dietary fiber. Containing about half the amount (37 mg per 100 g) of vitamin C as a raw orange, a single strawberry guava also has good levels of the dietary minerals, potassium and magnesium, and otherwise a broad, low-calorie profile of essential nutrients. Common guava has generally a more diverse and dense nutrient content, including extraordinary richness of vitamin C (228 mg per 100 g). Guavas contain both major classes of antioxidant pigments – carotenoids and polyphenols, giving them relatively high dietary antioxidant value among plant foods. Down the entire fruit, from the rind to the seeds. It's all edible – and nutritious. The rind alone has more vitamin C than you'd find in the flesh of an orange. You can score guava in the produce section of higher-end supermarkets or tropical fruit stalls.